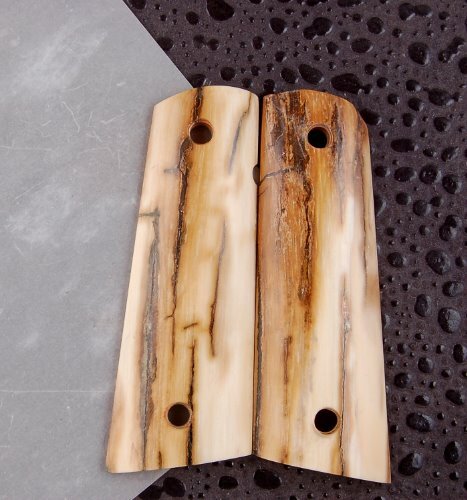 1911 Mammoth Ivory Pistol Grips. Pistol Types: Colt, All Kimbers, Les Baer, Springfields, Ed Brown, Uselton, Volkmann, Dan Wesson, Wilson, STI, etc. and all 1911 clones. Modifications: Upon request, can be cut for a ambidextrous safety, bob tail (Ed Brown) or Kimber's Super Carry Pro. Meets or exceeds all of Kimbers and Colts custom shops specifications. Perfect for a everyday carry pistol or that special pistol in your collection just waiting for ivory to complete its look. With its polish and warm colors these will frame out your pistol well and draw some attention on the range. Again, if you like that warm buttery feel you only get with real ivory, these are ones to have. Fine for every day carry. Both panels color match each other very well.